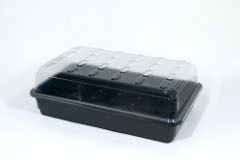 These great value propagators are manufactured by Garland, and sturdily constructed. Unlike some propagators, these can be used year after year. Each will easily hold a Root Riot/Rockwool tray of 24 cubes.